Based on George S Kaufman and Moss Hart’s 1934 play of the same name, Stephen Sondheim and George Furth’s celebrated 1981 musical, Merrily We Roll Along, follows the intertwined fates of three best friends. Frank is a talented Broadway composer-turned-movie producer; Charles is Frank’s sometime lyricist-turned-successful playwright; and Mary is a best-selling novelist with an undying passion for Frank which eventually tips her over the edge into alcoholism. Working backwards, the show opens at the peak of Frank’s professional success and personal unhappiness, a moment of Hollywood excess and soured friendships, and takes the audience on a journey right back to the friends’ days as fresh-faced artists trying to make it in the big city. Performed in Ballare, Director Alistair Henfrey’s staging is a fairly minimalist one, positioning most of the action on the ramp or in the DJ booth, while allowing the disco-balls and full length mirrors the club is known for to add a touch of Hollywood splash and sparkle to proceedings. In general, I would say that the staging worked well – aside from a few well-placed glowing blocks the only other set piece was a piano at which Frank would sit and tinker, Production Designer Michelle Spielberg putting the unique element of the production, Ballare itself, on full display. Meanwhile, Henfrey’s blocking largely enhanced this configuration, and I was particularly impressed by his careful use of entrances and exits as moments in which to establish and build character, as actors were forced to make the long walk down the side of the railing. But the actors themselves were the real heart of the show’s success, bringing an infectious energy to the venue (quite without meaning to I found myself repeatedly tapping my toes). Standout performances included Francesca Bertoletti’s pleasingly nasal Broadway diva Gussie Carnegie, complemented nicely by Oliver Rhodes’ brassy Joe; Rachel-Marie Weiss’ endearing Beth; Amaya Holman’s touching and strong vocal performance as a wry and pained Mary; and Mariam Abdel-Razek’s heart-warming Charley, showcasing her impressive vocal range. Henry Eaton-Mercer’s Frank was perhaps not the most vocally consistent, but was nonetheless an assured enough performance to tackle the challenges of being leading man. Special mention should also go to some of the minor roles: I particularly enjoyed Sophie Atherton’s bubbly TV persona and Jess Beaumont’s final scene cameo as the frequently-mentioned Evelyn. The entire ensemble worked well together, which is especially vital in a production such as this, with the large chorus numbers making theatre even more of a team sport than usual. The production, however, was not without its drawbacks. On the whole, I felt the acting to be stronger than the singing, despite there being a number of excellent vocal performances, and while the one large dance number was undeniably enjoyable, it had a slight air of being under-rehearsed. A more persistent problem was the musical balance. The production chose not to use microphones, which I think was a wise decision given the intimacy of the setting, but it did mean that often singers, especially those singing in their lower range, were somewhat difficult to hear clearly, and there was a similar problem with dialogue underscored with music. Nevertheless, directed by Michael Cullen, Sondheim’s score was generally handled carefully with suitable lightness. A more significant problem was the unraked seating. Although, of course it would have been challenging to accommodate raked seating in Ballare, sitting towards the middle-back of the audience, I frequently felt that I could only see a portion of what was happening on stage, which was at times a real shame and could have easily been rectified by having the actors stand a couple of feet upstage. The other most noticeable issue was the occasional tension brought out between the style and the venue. I would most definitely describe myself as a musical theatre fan and am generally unfazed by the typically heavy use of stagecraft by performers of the genre. 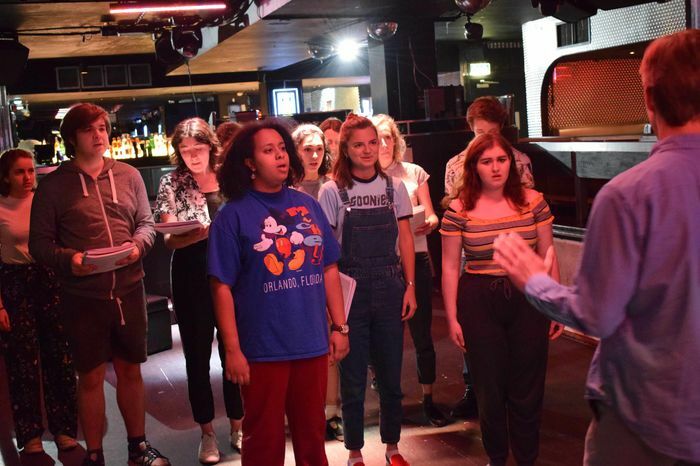 Musical theatre, after all, is often characterised by a strong emotional drive and was created for large theatres, so a little exaggeration can go a long way. In such an intimate setting as this, however, I felt there were occasionally moments in which this style seemed out of place and overblown, even detracting from the story’s emotional core to some degree, but in all fairness, these were few and far-between. All that being said, I very much enjoyed my time in the company of Frank and his motley crew of friends. The real strength of the show lies in the enthusiasm of the cast, highlighting the wit of Sondheim and Furth’s writing. If you’re a musical theatre fan, or even if you’re not, this one is well worth the price of the ticket.